Last site update: April 2009 : Box-Robot started. This project has been suspened until I find steady work and can afford the time and money for this. Objectives: To reduce the use of pesticides, herbicides & fertilizer. to continue the research & to build the first robot. other marine life that I'm fascinated by. This site exists to raise awareness and to find sponsors. Your Ad could appear on this page. of the robots and to do research, and perhaps develop some patents. Logos for cups, T-shirts, Photo CDs, etc. to help fund the research & purchase parts. Including some posters, T-Shirts & a CD of my top 500+ underwater photos. Or if you have a Paypal account you can use my email address ( tjfidler@telus.net ) to buy images or make a donation. Logo/Mascot farm robot. Only for advertising. Click on the image to be taken to the store. robot for awareness and advertising. Now available on T-shirts, Mugs, and more. Note: the original image is 2000 x 2000 pixels. Reduced here to fit on the screen. collected. Aphids however are a good candidate. first prototype, but instead is a logo or mascot farm robot for awareness and advertising. ground may be easier than removing them. The following image is a sample & a link to some of the items available using some of my underwater photographs. 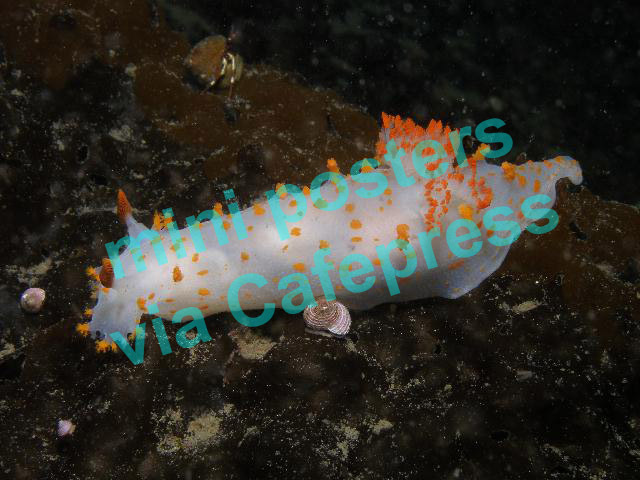 Click on the image below to be taken to the main page for marine life. How do you safely deal with weeds and harmful insects? The only way is the old fashioned way. You find a weed and you pull it. You find a "bad" bug and squish it. That means manual labor and the only feasible manual labor, without requiring more people, is robots. Over time robots will, and must, become an even more important part of how we will farm safely. Not only by minimizing the use of pesticides and herbicides but also eventually by helping to avoid the excessive use of fertilizers, and un-composted manure. They will do this by helping farmers practice safer farming methods which are more labor intensive. Excess fertilizers not only create unnatural conditions for excessive algae growth, which then clog streams and prevent normal plant life from existing there, and thus also force out the animals that depend on the clean streams to exist. But even worse, after the death of these huge masses of algae, and they begin to decay, they remove most of the oxygen from the water making it nearly impossible for fish & other animals to live under such conditions, and thus many streams literally die. Excessive nitrates from fertilizers are linked to a variety of cancers due to the nitrates remaining at high levels in the foods, and not just causing cancers in those living near the contaminated local soils and streams. Un-composted manure is the main culprit in too many under ground reservoirs containing un-healthy levels of bacteria, and is why almost daily we hear about somewhere in almost every developed country needing to have "boil your water" alerts. In a time when fresh drinkable water is becoming a scarcity, it is and should be considered a criminal act to pollute the very water we need to survive. Ultimately the problem is that we do not pay our farmers enough for their crops to farm sustainably, and thus they "must" often choose unhealthy methods of crop production in order to survive and put food on our plates. Supporting organic farming is not so much about nutritionally healthier food, and foods containing less poisons, it is more importantly about supporting farmers who pollute less, and farm sustainably. Remember farms are not in cities, they are in rural areas at the edge of wild places, and that means those farmers that don't use good farming practices are polluting wild places. Damaging what we consider precious. Farm robots will become the cheap labor that farmers need. The alternative is about a 25% (guesstimating) increase in the price of our foods so that all farmers can farm sustainably. Or just continuing to carry on as we are doing now so that our children and grand-children can, and will, suffer more and more for our greed. The latter will be an economic boom for the pharmaceutical companies as they develop new drugs to offset the poisons, hormone imbalances, and treating the cancers, and other deformities. Or even just contact me if you have any ideas or comments that you think would be of interest to me. Identifies & eliminates harmful insects. Monitor fungal infections thereby reducing its use by knowing about it sooner. Reduces the need to spray crops with pesticides. our food. Thus avoid GMO or Genetically Modified Organisms. Development of these robots will be an on going process, to make them cheaper and more efficient, but the first steps must be taken by someone. 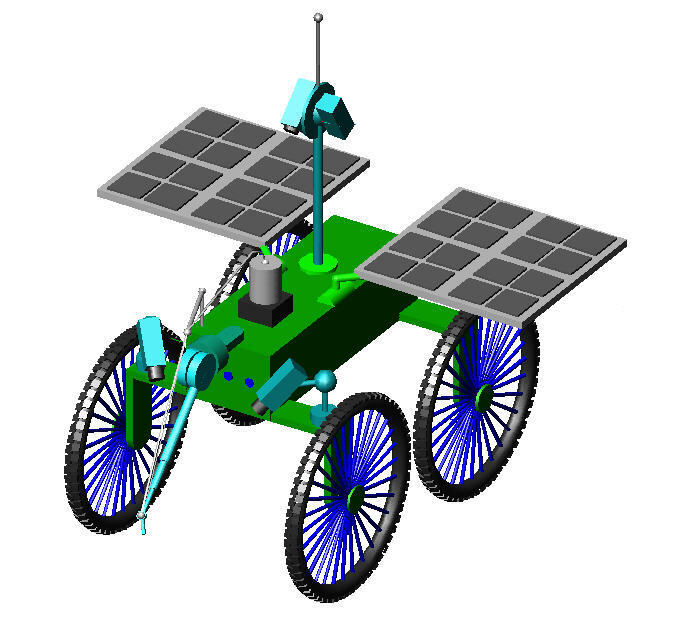 What I'm proposing will take at least a year for the first Remotely Operated Vehicle [ROV] prototype for a small wheeled robot, assuming we had the funds, and then proceed to develop the ROV robot into a more independent robot. An independent robot that could work on its own or with the help of a human. Someone I know suggested having a person help a robot as a way to employ people. That would slightly defeat the purpose, BUT someone helping several robots to do their job would be a feasible scenario. Farm robots would not initially be directly profitable by selling them, due to the fact that our farmers can ill afford more expensive technology. Instead they would at first be leased to farmers to avoid the need for them to actually pay for their whole cost. The cost of the lease payments would be less than, or perhaps equivalent to, the same amount of money they would spend on purchasing pesticides. Plus, there are tax benefits from leasing. My original plan was to use an existing patent of mine to develop a company to help financially support the research, and use other patents that would arise to help fund their development. But product development from a patent has turned out to be more expensive than I anticipated. And my school debt is a barrier to my doing much on my own at this time. Including preventing me from filing for my next patent. My next patent will hopefully be for a more efficient pesticide sprayer that could be sold to the farm industry and make a difference soon. One person who contacted me suggested: "A good natural control for a small hobby farm might simply be - to own a few chickens and let them run around your garden. Low tech and very environmentally friendly." Of course, if we're talking about tall crops like corn, or if there are a local predators, or several acres then we're back to needing robots. They never get bored, systematically inspect every plant for insects and their eggs. And unlike chicken they would also know the difference between weeds and the crop seedlings. The first thing you need to know is that these robots are NOT intelligent, and they are NOT fast. They simply move along guided paths through crops and when an insect that is harmful is found it is either picked or sucked up into a container. The robot itself acts as a "probe" that would probably be controlled by a faster computer like one of today's good personal computers. Originally I was thinking of using the main computer to "see" for the robots and identify the "good" insects from the "bad" ones. But unless I can either use multiple bandwidths to transmit visual information from the robots to the main computer(s), then the amount if information that needs to be moved is a problem. One alternative is to work on parallel processing. I am considering using parallel processing because the slower processors are more thermally stable and cheaper. However, it looks like it would be wise to build one robot using a fast processor to see exactly how much processing is required by the vision routines. Experiments so far show that an 800 MHz CPU can do a fair amount. Either way, any design would need to incorporate a plan for absorbing the heat from either one fast processor or multiple processors. Another limitation is power and this may be the main limiting factor. The robots are not going to be that fast, in terms of a rolling, or walking, speed, because that would require too much power. If they moved too fast this would also require more powerful processors to process the images faster to look for insects and compare them to ones in the database. For me, the purpose of learning how to build robots is to help the environment by reducing the poisons we claim we need to use on our food. Another thing they will be able to do that is simple is to monitor soil moisture levels, and to report this to the farmers so that they can make better use of their limited water supply. There are infinite designs and uses for robots, many of which can help to build a greener tomorrow. For other projects I'm interested in see the section on "other projects" on the About the Author page. Robots used to help reduce the amount of garbage that ends up in landfills by helping sort it. Version 1 of the "Proof of Concept" - Small wheeled farm robot. For removing aphids & caterpillars from short plants. Potentially an ideal farm robot for tobacco plants, as aphids are a major problem for tobacco plants. Solar panels would provide a large portion of the energy. This robot has only a simple arm with only 3 degrees of freedom of motion. This will make it easier to program and thus faster and require less power. Missing from this image is solar cell and tire cleaning mechanisms. Project 0: The Box-Robot for testing and learning. I finally have enough parts to at least build a simple robot, to start working with the electronics, and start learning how to program a robot. This simple robot is just for me to learn more, and actually build a robot. With my layoff from my last job, due to the economic problems created by greety bankers and their , I took it as an opportunity to cash in some of my RSPs with them and complete buying enough parts for a simple robot. Project 1A: A small robot/rov about the size of a kids go-cart, but as tall as a bike, with a single arm that is designed to actually work with short plants in a garden, and whose basic principles could be applied to a larger robot/rov at a later date. Would allow the team to work on image analysis and programming the robot to start catching insects and perhaps later to pull weeds. And of course could consider one person helping several robots do their job as an employment opportunity. Time would also be used for working on a more efficient pesticide sprayer to have a more immediate positive impact on the environment (1-2 yr.). 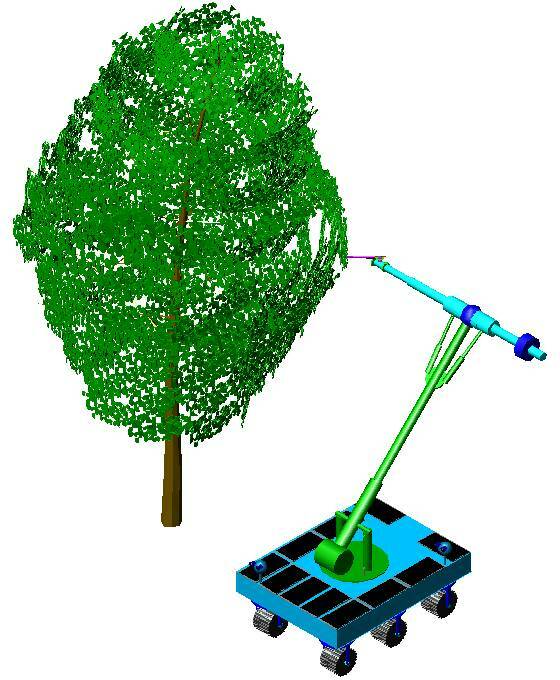 Project 1B (Depending on level of funding): An Orchard Robot; shown here inspecting a tree for leaf eating insects and potentially for signs of diseases that affect trees. Note the use of counter-balancing mechanisms to reduce energy requirements, and solar cells for additional energy. Project one will allow the team to hone their skills in robotics and gain experience on all the major systems needed to carry on with other robot projects. Project 1C Build a robot for personal gardens. To remove pests and remove weeds. Should really be a Project 2B project. That is after we learn how to build something like a robot described in Project 1A. But if someone wanted to fund that directly or indirectly. Estimate of time for first ROV [Remotely Operated Vehicle] prototype around 1 year and $200,000 ($300,000 for 1B project). (See DevelopmentPlanPage and BudgetPage and PartsPage. [NOTE: Pages being modified from Orchard Robot requirements to small wheeled farm robot requirements.] ) Most of which is wages for three people, parts, machining costs and software purchases. I have not selected any other people at this time so as long as they have some technical training you could help me choose who to hire. Would like to include some funds for an international patent for a product for which a market already exists, or at least start by filing for a patent in the USA. The ROV would then be converted to a "real" robot over the following year. Project 2: Multi-legged farm robot insect hunter for working in fields for crops like potatoes, tobacco, ... Click on the concept drawing below or click on the following link: InsectHunterPage. For removing the harmful insects and leaving the good ones alone so that they can carryon doing the things they are best at like pollinating, aerating the soil and eating other insects. Pesticides on the other hand are indiscriminate killers that kill almost everything and make others sick. Working on a new version. Click on it to go to page. Robot for working on trees. Farmindustrynews.com/mag/farming_robot_farmers_cheap : Cheap farm robots? Maybe someday. Why help me? I've just finished my Bachelor of Computer Engineering degree ( A mature student. ), and I also have a diploma as a Robotics & Automation Technologist. I've been working towards the goal of using robots to help clean up our food supply for around seven years, but originally started off with the idea of building robots to help process garbage so that less ends up in land fills. Still thinking about working on robots for that as well. Developing robots is not just a matter of creating my own job now that I've just finished school, but instead more about developing these robots to use technology to help reduce the amount of poisons, like pesticides and herbicides, used by farmers. These toxins not only hurt birds, frogs, ... that live around the farms, but also hurt people who live around the farms and where ever the water from the farms ends up. And that water ends up not only in nearby streams, but also ultimately in the oceans of the world. In the end everyone is exposed to the pesticides & herbicides used by all farmers in the world. Reducing the use of these toxins will reduce the chances of everyone from getting cancer, and other deformities and illnesses. (See Pesticide Health Issues) Parkinson's can be triggered by pesticides. Other uses of such robots are to monitor moisture levels in soil for better water conservation and the design of a robot to apply pesticides/herbicides more efficiently. As well as the exploration of robots for the application of fertilizers more efficiently to reduce excess nitrogen in foods and the water supply - excess nitrates have been linked to cancers. And excess nitrates cause algae blooms in water ways that can choke the life out of streams & lakes when the algae die and consume oxygen in their decomposition. What I'm working on: Presently looking at image analysis algorithms. Items Purchased or Donated: A few parts and software but only enough to learn skills that will help later on, and get me a better job to support my own research. Copyright © 2006, 2007, 2008, 2009 by Terrance J. Fidler. All rights reserved.